Playwright David Mamet is best known for quick, profane, tough-talking dialogue, captured in his iconic work, Glengarry Glen Ross. When GGR went to the big screen, he wrote the screenplay, but let James Foley take the helm. Mamet stayed closer to some of his other productions, like his thriller con debut, House Of Games, which was also in the dark and chatty vein. But one of Mamet’s most successful efforts—while still a con, of course—is almost a complete departure from his usual brand, namely due to its quiet, thoughtful pace. The Spanish Prisoner is named after a legendary long con, and here Campbell Scott, in full-on Jimmy Stewart “aw-shucks” mode—he is repeatedly referred to as a “boy scout”—plays the innocent man snared in a web of dark conspiracy. Scott’s Joe has created some mathematical equation referred to as the “process,” which is about to make the company he works for loads of money. Meanwhile, he’s still bugging his boss (the inimitable Ben Gazzara) about his bonus. On a trip to the Caribbean to parade the process in front of some bigwigs, Joe meets the enigmatic Jimmy Dell (Steve Martin, masterfully playing against type). It was a genius stroke from Mamet, who wrote and directed, to cast Martin: By 1997, everyone knew how much simmering energy the comedian contained underneath, so his calm, collected Jimmy is clearly a master of control, which only adds to his menace. Jimmy encourages Joe to protect his interests by taunting him with the promise of fixing him up with his Olympic-caliber tennis-playing sister. Joe’s seduction into this scheme is so easy he practically falls right into it: a few softball compliments, an exclusive resort, an elusive young and pretty girl, a vintage book wrapped in brown paper. Mamet’s screen direction is steeped in his theatrical experience: Nearly every scene is a close two-person shot. From Mamet’s viewpoint, tight settings like a shadowy conference room, a small boat dock, or even the first-class rows of an airplane could be easily transferred to the world of the stage. Mamet wrote The Spanish Prisoner straight for the screen, but it maintains that kind of claustrophobic intimacy throughout, especially when Joe gets quickly in over his head and winds up in an interrogation room. Seemingly inconsequential decisions—why did Joe exchange so much money in the Caribbean?—now take on a tinge of suspicion under so much scrutiny. Eventually Joe, like Hitchcock’s Grant and Stewart before him, finds himself at the center of a conspiracy and running for his life. But where Hitchcock often tossed in an action sequence for fun (on Mount Rushmore, say), Joe’s peril is carefully plotted out through Mamet’s clipped, mannered, increasingly tense dialogue. 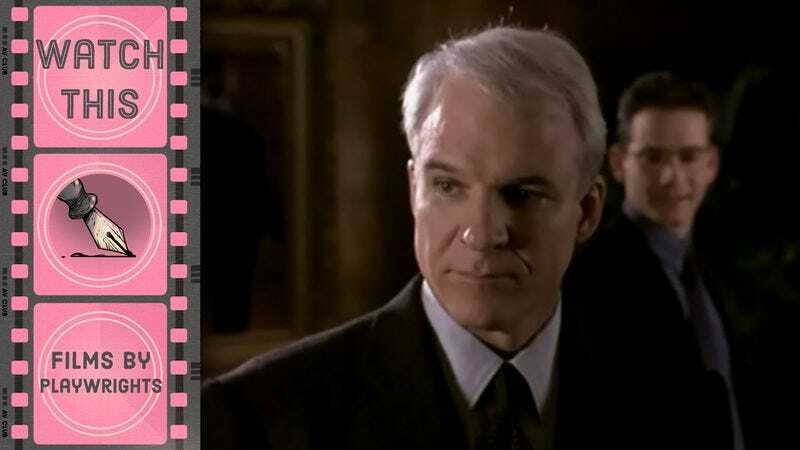 Like Hitchcock, Mamet lays out the seeds of Joe’s destruction from the very first shot, when he’s at an airport under the sign that cautions people not to take packages from anyone. Mamet uses seemingly inconsequential items to trap Joe, making that brown-paper-covered book as menacing as a gun or a bomb. The character starts out trusting almost everyone—his boss, Jimmy, his partner, his assistant Susan (Mamet’s wife, Rebecca Pidgeon, whose performance has to be endured more than enjoyed)—and nearly every time he’s wrong to do so. So even though The Spanish Prisoner is several decibels lower than a typical Mamet production, its veiled mantra—that you really shouldn’t trust anyone—makes it that much more terrifying. The movie’s quiet cements just how isolated Joe ultimately is. Availability: The Spanish Prisoner is available on DVD from Amazon or possibly your local video store/library.